All teachers know the social/emotional development of our students is at the forefront of our daily instruction. 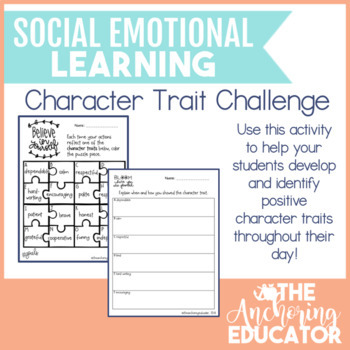 This no prep activity can be used to help your students develop and identify positive character traits throughout their day! Use this as a character trait challenge for individual students or use it to determine character traits in both fiction characters and/or in non-fiction biographies! Once they have identified the character trait in themselves or in a text, they may color the corresponding puzzle piece. Then, students give evidence of how/when that trait was lived out on the corresponding recording sheet. You can also identify the character traits as a whole class! If you enjoy this product, you may also be interested my Kindness Challenge. I hope this product helps to promote a positive social/emotional environment for you and your students!